Joe Henderson is a personal hero. The author of many books and articles on running, Joe is a “writer’s writer.” He’s the kind of craftsman other writers admire, for the year-in, year-out quality of their work. He’s a hero as a runner, too. I return often to Joe’s simple training formula: run everything 1-2 minutes slower than your equivalent race pace for the distance, and race often. In a July 2005 article in Marathon & Beyond, Joe talked about two of his heroes: Ed Whitlock (3:15:54 marathon at age 80) and Herb Phillips (2:47 at 64). See “Slowly, Then Swiftly,” Joe Henderson’s Running Commentary #952. Both runners follow Joe’s formula – go (relatively) slowly most of the time, and run fast in frequent races. I’m not racing these days, but I still like to run fast as often as I can. Joe’s method works for me. At age 70, it just takes lots of slow miles to recover from every all-out effort. If you read these columns, you know I love to tinker with my training. One month, I’m enthusiastic about developing leg strength. The next month, I’m keen for doing 10-second fast bursts during slow runs. Does the helter-skelter scatter of my ideas make me a dilettante? Not when I check the results. In fact, I don’t choose these ideas – they choose me. I follow where my intuition leads me. So far, it’s led me to Arthur Lydiard, sprint coach Barry Ross (high school strength coach of Allyson Felix), master’s coach Pete Magill, and Keith Livingstone (Healthy Intelligent Training). And, of course, Joe Henderson. My intuition proves its worth where the rubber meets the road – I’m a happier runner today than I was 10 years ago. I’m much happier than when I relied exclusively on reason and logic. My intuition comes from two directions. First, there’s the body’s simple signals. The body talks to us through our feelings. It tells us when it’s unhappy by giving us sensations of physical discomfort, and an inner sense of disharmony. When the body approves of what we’re doing, it rewards us with inner harmony and joy. Honoring these feelings is the simple formula for “feeling-based training.” It’s a formula that all great runners follow. For example, the elite Kenyans monitor their feelings and train accordingly, to the extent that they’re willing to shorten or abandon a run when the body says so. You can monitor your heart rate, running at a certain percentage of maximum. Or you can measure and time every mile, staying within a predetermined pace range. But there’s a simpler, and I think better, way to settle into a pace that’s right for you. Just relax and let whatever happens, happen. Don’t force a pace onto your run. Let the right pace for the day, and the moment, automatically find itself. The higher guidance is different from the body’s signals. When we “listen to the body,” we’re generally looking to improve our fitness and enjoy our running more. Those signals come from the body, by way of the heart. But the superconscious guidance includes the parts of our life that lie outside the narrow circle of our training. In fact, the superconscious is cheerfully willing to completely trash our running, if it’s what will help us find a higher level of happiness. Years ago, I lived in a community of spiritual seekers in the foothills of the Sierras. One morning, I set out on a run. As I always do, I prayed for guidance to make the right decisions and avoid ego. After no more than a half-mile, I felt as if my shoes were filled with lead. It was strange – a powerful force seemed to be pulling me back to the Village. I turned around and headed back to work, where I found my spiritual teacher waiting. He had received an important letter from Germany, and he needed someone to translate it. I don’t think he actually “called” me back to the office. But because he’s completely dedicated to serving God, I believe God “invited” me to turn around. I’ve reached a point in my training where I believe it’s wise to take time at the start of every run to die a little bit. I find that the more I’m able to kill the part of me that resists the inner guidance from my body and soul, the happier and more successful I am. The more I can murder those rebellious feelings, the more I feel a joy in running that overflows into my life. 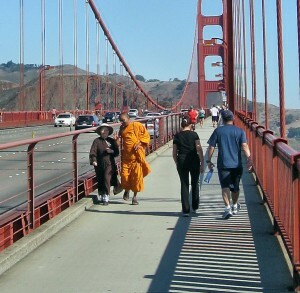 I’m inspired when I see monks and nuns in public places. On runs across the Golden Gate Bridge, I’ve seen monastics from various lands – Theravada Buddhists from Thailand, a Zen nun from Vietnam, and Catholic monks and nuns. I always bow inwardly to them, and quietly thank them for supporting the notion that the pleasures of this world are but dim reflections of a greater joy within. Whether it comes through the body or from Spirit, a touch of that deeper joy is something I’m always seeking when I run.